Throughout our community-led process, it became clear that the Bridge Park had the potential to be more than a park. In particular, the Bridge Park could symbolize a unity and a new connection between a booming area of the city and one that has long been excluded from the city’s economic progress. A key goal of the Bridge Park is to serve as an anchor for equitable and inclusive economic growth. The Bridge Park’s design strategies will increase connectivity between those living on both sides of the Anacostia River, but more must be done to ensure that residents and small businesses nearby will continually benefit from the success of this signature new civic space. To achieve this goal, the Bridge Park staff worked with community stakeholders to create an Equitable Development Plan in 2015, that was updated 2018. The goal of the Bridge Park’s Equitable Development Plan is to ensure that the park is a driver of inclusive development—development that provides opportunities for all residents regardless of income and demography. By following a community-driven-vetted process, it is our hope that other cities can look to the Bridge Park as a prime example of how the public and private sectors can invest in and create world-class public space in an equitable manner. The speed of change and economic opportunity that D.C. has experienced over the past 10 years has been tremendous, but inequitable. Decades of disinvestment, coupled with the economic, racial and geographic segregation of Wards 7 and 8, mean that many of the communities east of the river are areas of low homeownership, high poverty and unemployment. 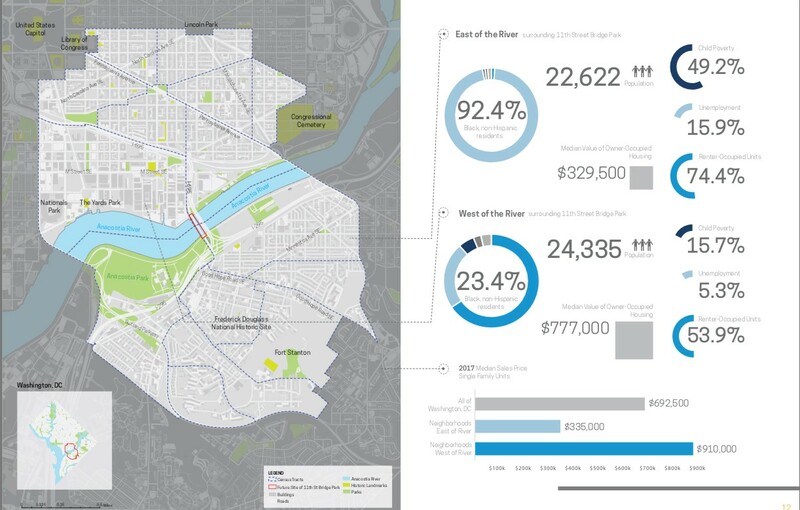 With an increasing wealth gap and a high concentration of poverty east of the Anacostia River, the Equitable Development Plan strategies provide a new way to address these challenges. Our Equitable Development Plan focuses on the one mile area surrounding the Bridge Park. • have voice and influence in the decisions that shape their neighborhoods.